Today’s Liturgy is long, and perhaps that’s why the Sacramentary instructions say that a “brief” homily may be given, and I promise, I will be brief. On this Passion / Palm Sunday, the homilist’s job is a bit precarious. It’s precarious because there’s the danger of the homily becoming a distraction from the power that is within the Liturgy itself – a Liturgy that is unique as we seek not merely to remember the beginning of events that happened two millennia ago, but as we truly transcend time and are, once again, entering in a way that we can’t fully explain and don’t clearly understand, the Mystery that we sometimes too easily call “the passion, death, and resurrection” of Jesus. The Liturgy of Passion Sunday is filled with contradictions, drama, and even shock. There’s the apparent joy of what we call Jesus’ “triumphant” entry into Jerusalem; the dramatic events of the ensuing hours; and most especially the shock of the Cross. Shock is very powerful; it can take our breath away, leave us without words, and cause us simply to wonder. Perhaps, like me, you were shocked earlier this week when you heard the news of a young mother who drove her minivan into the Hudson River, killing herself and three of her four young children. Perhaps you were shocked, as was I, when you heard of the recent, sudden, and very sad death of a long-time member of this community. Perhaps you’ve been shocked when you’ve heard about the betrayal of leaders such as priests and bishops or popes who’ve played a role in stealing the innocence of the young, or who – for the umpteenth time – said something that excluded this or that branch of God’s Family Tree, something one could never imagine coming from the lips of the Man from Nazareth. Perhaps you’ve been shocked by a personal betrayal by a family member, close friend, or significant other — a betrayal by someone you love who has hurt you in one way or another. In a few moments we will listen for the first of two times this week to the long story of Jesus’ final days and hours. The most shocking words we will hear are those of Jesus himself who, when dying on the Cross, wonders out loud whether or not he has been abandoned by God: “My God, My God, why have you forsaken me?” Yes, we know how the story ends … and we are glad for that. But so that the true and full power of that ending might transform us in whatever ways we need to be transformed, let us not too quickly run from the Cross to the empty tomb. Rather, let us take time here and now and throughout this week to be fully engaged in this, the Passion of Jesus, allowing our Passions to be one with His, our sufferings to be one with His, our betrayals and hurts and crosses to be one with His; because the more fully we are one with Jesus in this the hour of His Passion, the more fully we will be one with Him in the eternity of His joy that we know is yet to come. 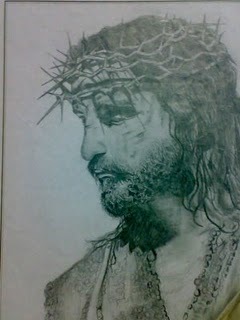 This entry was posted in Homilies and tagged Passion of Jesus, the Cross. Bookmark the permalink. Yes, brief but powerful. Our prayers continue that all of God’s people are viewed by everyone as God’s people.